I love all my gadgets and devices, especially the iPhone and iPad. I use them everyday, and constantly throughout the day. The one thing that really annoys me is all the fingerprints and smudges that appear on the screens from the heavy use. Lucky for me, there are Toddy Smart Cloths! Toddy are microfiber smart-clothes that make cleaning your device simple, easy, and at the same time, is quite stylish! Without the need of any liquids, these clothes come in many beautiful colors and patterns. Each cloth is 5″x7″ inches, small enough to carry around, yet big enough to clean with about two swipes. One side has a beautiful pattern on silk microfiber. The other side is made of a soft microfiber in a color that matches the pattern. To use, simply wipe the screen of your iPhone, iPad, laptop, smartphone, or tablet screen on this microfiber side. This cleans the screen of dirt, smudges, etc. It may take 2 or 3 swipes before all the fingerprints and smudges are removed. Next, polish the screen up using the silk pattern side. Although there are many brilliant patterns and colors to choose from, you also have the option of branding the cloth with your own design and logo! To find out more, see the branding part of their website. Overall, I think the Toddy smart cloth would make a great companion for any gadget lover. It’s both beautiful and functional! And note, a lot of us geeks also wear eyeglasses — they’re great at cleaning those too! Disclosure: This product was sent by ToddyGear for review purposes. This is part of Beatweek Magazine’s coverage of iPad products. Opinions expressed in this article are my own. Just Mobile is known for their simple and elegant designs and their latest iPad Stand, the Encore, is just that. It’s light, portable, and highly functional. The Encore iPad stand has a beautiful circular base with a silver finishing that matches the back of the iPad perfectly. This makes it look seamless, as if it was part of the Apple iPad suite. Attached to the back of this circular base is a hinged arm that holds the iPad in place. This hinged support is easy to move up or down so you can place the iPad in your preferred viewing angle. On the front of the base is a 2 inch rubber stopper that follows the circular pattern of the stand. This soft base holds the iPad in place, and at the same time, prevents any scratches to your device. To use the stand, simply place your iPad in the middle — between the front stopper and the hinged back. Move the hinge to the angle you want and you’re ready to play your game, read a book, or just surf. 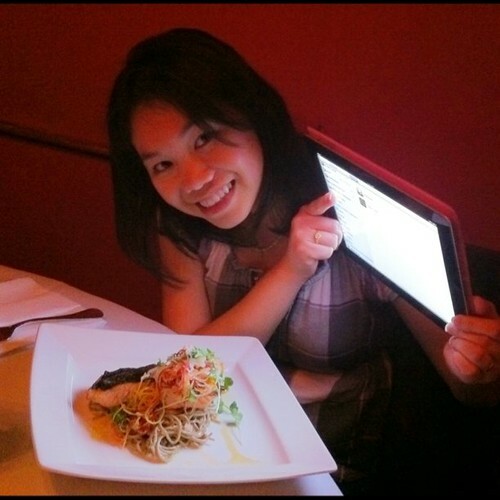 The iPad can stand in either landscape or portrait mode in the Encore. What’s nice about this stand is that even though you may put it in portrait mode, you still have access to the Home button. The front stopper is low enough to not cover the button. This iPad stand is recommended for the frequent traveler since it’s portable, or if you enjoy playing games, or reading a book at your desk. Although it does fold down into a typing mode, the angle is still steeper than what you may be use to. I don’t recommend using this stand if you plan on typing long documents on-screen. Overall, the Encore is quite a beauty, and would make any iPad own really happy. In addition to just holding iPads, this stand will also hold other tablets and eReaders (even the small 6″ Nook). The Encore is more than just a tablet stand, it’s a work of art, adding beauty and elegance to any desk. Hold the light at the right angle on your subject. Snap a photo on your other device in the other hand.